Performers include: James Norton, Juliet Rylance, David Strathairn, Faye Marsay, Aleksey Serebryakov, Mariya Shukshina, Oshri Cohen, Merab Ninidze, Kirill Pirogov, Yuval Scharf, Sofya Lebedeva, Clifford Samuel, Anna Levanova, and David Dencik. 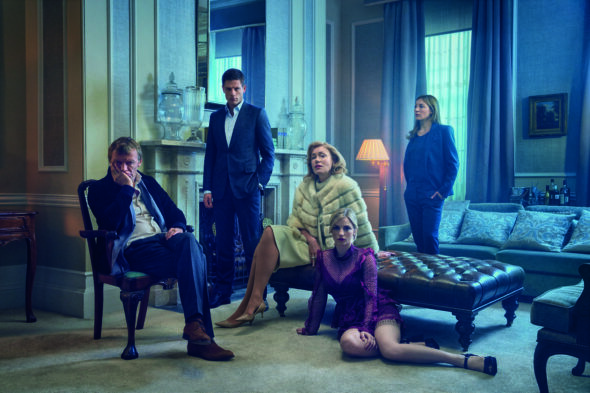 From creators Hossein Amini and James Watkins, the McMafia TV show is an international crime drama inspired by Misha Glenny’s book, McMafia: A Journey Through the Global Criminal Underworld. The thriller centers on Alex Godman (Norton). Although Alex was educated in a British boarding school, he is son of Russian exiles with connections to organized crime. For his entire life, Alex has been trying to escape the taint of his parents’ history with the Russian mafia. In addition to establishing his own, legitimate business, he plans to build a life with his girlfriend, Rebecca Harper (Rylance). At 33 years of age, Alex is the CEO and manager of his own hedge fund. While he was born to privileged circumstances, Alex is smart, loyal, gifted, and determined and has always beaten his own path. Although he is proud of his Russian heritage, he tries to distance himself from aspects of it. Meanwhile, his uncle Boris (Dencik) is still all in. Despite being exiled and having the chance at a new life, Boris is still deeply involved in crime. He still holds a grudge against those who banished him and his family from their lives in Moscow. With no sons of his own, Boris will do anything for Alex, but sometimes, his help proves harmful. Life in London still leaves Alex’s father, Dmitri (Serebryakov), feeling a bit lost. As his drinking increases, so does his depression. He still longs to bring his family back to Moscow for good, even though he knows they can never reclaim the past. His wife, Oksana (Shukshina), loses patience with him as her suspicions grow. Unlike her brother, Alex, Katya (Marsay) has no real sense of drive and parties too much. While she wants the best for her family and appears successful, her life is relatively empty. As an orphan of Irish descent, Alex’s girlfriend Rebecca is moral and strong-willed. She serves as an advisor to an ethical capitalist and isn’t swayed by money, status, and luxuries. Unlike Alex, Rebecca is an open book and she struggles to understand him, sometimes. Another Russian exile, Semiyon Kleiman (Strathairn), became an Israeli citizen. He’s made his mark in both shipping and entertainment, but his connections don’t stop at Israel’s border. Despite his preference for words over violence, he’s a criminal at heart. Once Vadim Kalyagin (Ninidze) and the Russian government stripped him of his assets, Semiyon became hellbent on wreaking vengeance. A former KGB officer and veteran of the Afghan War, Kalyagin is a lethal man who is not averse to getting his hands dirty. He is successful in post-Soviet Russia, but looks upon the globalized world with contempt and, in a sense, resents his own success. When the family’s past returns to haunt them, Alex has to decide what he is willing to do to protect his loved ones. As this story of survival evolves into one of revenge, it also explores how corruption permeates the modern world. What do you think? Do you like the McMafia TV series? Should this TV show be cancelled or renewed for another season on AMC? When is McMafia coming back? I love this show!!! Thank you for a quality story line which makes you feel a part of the episodes. I do not feel like I’ve wasted my time watching it. A complex storyline that needs to be followed closely and paid attention to. It took me the first 3 episodes to actually learn what was going on and how Alex is transformed from investment banker to a serious player in the criminal underworld, literally overnight. I truly like McMafia. It is a great series!!! I never wanted to see the Godfather movies, however, I am obsessed with the McMafia series. I liked James Norton in Grantchester and he is wonderful as Alex. The rest of the actors do a great job, too. Please run this series for a long time!!! It is my guilty pleasure!!!!! AWESOME series!!!!! It’s as compelling as The Godfather!! I wish it lasts a couple of years. All the actors are doing a superb job. but the story is intriguing and I would like to see it renewed.